Is the Great Blue Turaco a bit cuckoo? On my trip through Uganda I've only encountered one Turaco. Just one. But it happened to be one of the most beautiful Turacos: the Great Blue Turaco. In the morning we went to Kibale National Park in Uganda for watching the chimpanzees, in the afternoon to the neighbouring Bigodi Wetland Sanctuary. A great place for birding and seeing lots of wildlife, especially monkeys. And between the trees and the vast fields of papyrus there was this Great Blue Turaco in a tree. The Great Blue Turaco is a beautiful and colourful bird. Admired for its feathers by generations of Africans and African royalty. This Turaco is also the largest Turaco out there. And the largest bird withing the order of Cuculiformes. But there is the catch. The Turacos are - according to some scientists - no longer within the order of Cuculiformes. Bird taxonomy can be tricky. You might even go cuckoo over it, since there is not always consensus of where in the tree of evolution a certain bird or bird family belongs. The Cuculiformes, briefly 'Cuckoos and allies', is an order that traditionally comprises 3 families: Musophagidae - Turacos and allies, Cuculidae - Cuckoos, Coucals, Roadrunners and Anis, Opisthocomidae - Hoatzin (or Opisthocomiformes). The Hoatzin is an amazing animal, unfortunately I have never seen it in the wild (well I haven't been to the Amazon basin to be fair). And if the debate about Musophagidae below might be complicated or up for controversy, that is peanuts compared to the controversy of the Hoatzin and its ancestry. Apparently it is the taxonomically most enigmatic bird that exists. According to the Sibley-Ahlquist taxonomy the Turaco family (Musophagidae) does not belong with the Cuculiformes. Instead, they are too distinct and should be granted their own order: Musophagiformes. Encyclopedia Of Life uses several schemes of taxonomic ordering (there are several systems out there and not every organisation has concensus with all the other organisations) and most of them - especially the recently reviewed ones - now go for placing turaco's and allies in their own order. Yet, the IUCN Red List for Threatened Species chooses to keep them within Cuculiformes. Literally a bit cuckoo and confusing. I chose to position Musophagidae within their own order: Musophagiformes. Just for the reference, I keep the family of Musophagidae within the Cuculiformes. With a dashed line and it will link to the page below the new order of Musophagiformes. 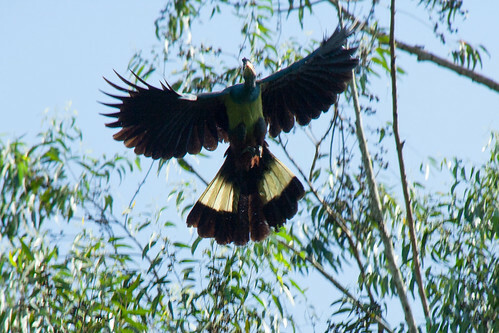 And for the record: the blue bird in my 'jungle bar' at the top of this website is inspired by the Great Blue Turaco. Especially its colours. So you know. The monkeys are just generic monkeys that on purpose look like no actual species.